After staying up late with the road crew last night I got a pretty late start on the morning. I spent some time visiting with Bob, the motel owner, before I started riding with the destination of Eads in mind. It ended up being a great day to put on miles, with a strong tailwind from the east pushing me down the road. 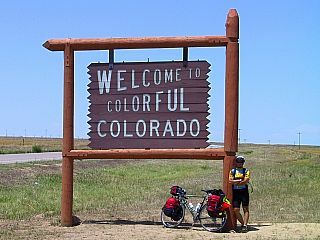 As I crossed the Colorado state line I began to wonder if I could make it further than Eads. With the wind at my back it looked like I could just make it to Ordway by sunset, and when I made it to Eads I decided just to keep on rolling. I don't really like riding as much when I'm pushing hard to make miles, because it doesn't give me time to stop and look and talk as much as I would like. Along the ride today I met an eastbounder, Bob Weitzel from Wisconsin, but only stopped long enough for a brief hello before getting back on the road. Despite pushing for miles as best I could, the sun set with forty-five minutes of riding ahead of me. Although I generally don't like to ride after sunset, the promise of a bed ahead and the fact that traffic was nonexistent encouraged me to go ahead and press to the end. I spent the night in the Hotel Ordway, which has been taking in cyclists since 1976. For only $10 the hotel provides a small clean private room and communal showers down the hall. I was so exhausted when I checked into my room that I didn't even have the energy to walk two blocks to find some dinner, so I ate the last two granola bars from my bags and crashed for the evening. My night in Ordway was my first night in Colorado, which marks the sixth state on my ride, and today’s 100-mile-plus ride might be my last. 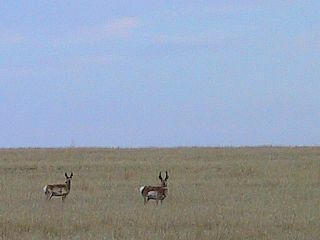 With the passing of the plains of Kansas and Colorado my opportunities for long flat days will soon be behind me.